A fresh take on sidechain-triggered dynamics processing, Peak Rider is a solid tool for mixing and creative purposes. Transparent sound. Novel idea works well. Zero latency in RMS and Peak modes. Multiband functionality adds versatility. Great mixing tool. No VST3 version, which seems odd given the remit. 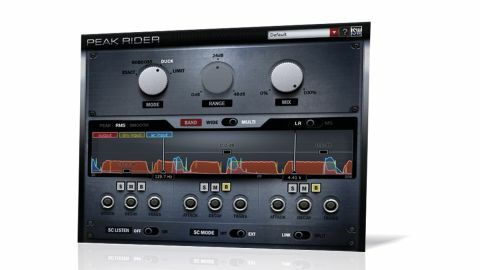 Impact Soundworks' debut plugin, Peak Rider (VST/AU), claims to be able to match the dynamics of an input signal to those of an external or internal trigger signal with zero latency. It works by employing compression, expansion and/or limiting to 'ride' the input signal's volume - both boosting and attenuating it - using the dynamics of the trigger signal as a guide. There's a choice of four Modes to govern its behaviour, a Range dial to set the amount of compression or expansion applied in certain modes, and a wet/dry Mix control to enable parallel processing. Below the Mode, Range and Mix knobs is a display that visualises the input and sidechain signals, with the option to switch between frequency spectrum and envelope analysis. Peak Rider can operate as a stereo or mid/side processor, and in Wideband or three-band Multiband mode. The multiband functionality is pretty standard, with two adjustable crossovers, dedicated Gain, Mute and Solo controls for each band, a choice of minimum- or linear-phase operation, and adjustable filter slopes (6, 12 and 24dB/octave). When using Peak Rider in Wideband mode, the crossovers instead control the cutoff frequencies of high- and low-pass filters applied to the trigger signal. Each band also features Attack and Decay controls for shaping the trigger signal response, and the Trans knob for tweaking the processed signal's decay/sustain - values below the Decay time increase the sustain of the input signal envelope, while values above reduce it. At the bottom of the interface are controls for monitoring the sidechain signal and switching it between External and Internal sourcing, and enabling stereo linked processing. The broad shape of the dynamics envelope generated by the trigger signal can be adjusted by selecting Peak, RMS or Smooth modes. Peak is best for material with sharp transients such as drums; RMS mode is useful for processing sustained sounds; and Smooth mode uses lookahead to analyse the trigger in more detail, giving cleaner results with complex material such as rhythm guitar, at the expense of increased latency. The all-important sidechain can either be fed an external source signal or, for conventional use as a compressor or transient shaper, the input signal. The plugin isn't VST3 compatible, and so requires routing through a dual stereo channel to work as intended in Cubase - strange given that it's so sidechain-dependent. Peak Rider does a great job of imposing the dynamics of one signal onto another, and is thus useful for vocal multitracks and layered guitars, for example. We also got convincing results using it to impart the dynamics of a 70s funk break onto a sequenced breakbeat. We like the versatility of the switchable RMS/peak/smooth processing modes, which open the plugin up to use on a wide variety of material. The multiband functionality is particularly useful for improving the kick/bass relationship using Duck mode. Peak Rider is wonderfully transparent- sounding and easy to use, and we're impressed by not only its nifty dynamics matching functionality, but also its strengths as a general compressor/expander and transient shaper.